Our roofing services in Alliston, ON are a grade above the rest, and you won’t find better customer care and focused attention. No one wants to suddenly find out that they need a roof repair – or even worse, have their roof replaced! Luckily, our team at Slippery Slope Roofing provides services to meet all of your roofing needs from small to large. With over 50 years in the business, we provide excellent customer service and will assist you every step of the way. Roof Repairs – Do you have a roof leak, or was it damaged during a storm? Don’t wait around to have it fixed before it gets worse. Our work is detailed-oriented and efficient, and we will get your roof back to its best shape. Roof Replacement – Whether it is because of the age of your roof or because of damage, roof replacement can be a daunting task. We pride ourselves on providing efficient service and quality workmanship. We won’t take shortcuts, and that means you will have a reliable roof again in no time. 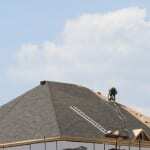 Roof Installation – During the home-building process, don’t rely on just anyone to complete your roof installation. We focus on only one roof project at a time, so that means during your roof installation, we ensure that you are getting the roof you always envisioned. Our roofing services are a grade above the rest, and you won’t find better customer care and focused attention. Roofing services are important to the function of your home, and we are the experts who will help you with all your roofing needs. If you are in the Alliston, ON area and you need roofing services, please call us today! We will get you on your way to a fully functional roof! At Slippery Slope Roofing, we offer high-quality roofing services in Alliston, Barrie, Orillia, Bradford, Newmarket, Cookstown, Beeton, Innisfil, Angus, Collingwood, Wasaga Beach, Oro-Medonte, Midland, New Tecumseth, Clearview, Bradford, Essa, Stayner, Springwater, and surrounding areas of Ontario.